A dental injury is when you damage your teeth, lips, gums or tongue. Dental injuries or dental trauma can happen for any number of reasons – everything from a fall or playing sports to road traffic accidents. If you get hit in the face, your teeth can become loose or chipped, or be knocked out completely. If you have a dental injury, it’s important to learn what the treatments are, and how to care for your healing mouth. Open our toothbrush trivia infographic. If you or someone you’re with has a dental injury, it's important to get the right help. Otherwise, contact a dentist straight away – your dental surgery should still be able to help you even if it’s outside usual hours. Otherwise, they might direct you to an out-of-hours dental service. Aim to do the following if your tooth has been knocked out. Try not to touch your tooth's root – it's best if you handle it by the crown (the white bit at the top). If possible, put your tooth back into its socket in your mouth. This is called reimplanting. If your tooth is dirty, gently rinse it with milk or tap water, but don't scrub it. Don’t let your tooth dry out. Try to put it in the right way round – it should be clear which way feels and looks right. The important thing is to put it back in as quickly as possible. Bite down gently on a clean handkerchief for 15 to 20 minutes to help keep your tooth back in place in its socket. If you can't reimplant your tooth, store it in milk or put it inside your mouth between your cheek and gum until you can get to a dentist. If you haven't got your whole tooth, don't try to put a broken tooth back in your mouth. Store it in a pot of milk or in your mouth, because your dentist may be able to reattach it. Even if you don't think your tooth is broken, it's important to see your dentist as soon as possible. They can check you properly to see what treatment you need. Below is an overview of how your dentist will treat loose, knocked out or chipped teeth. If you have other injuries that need treating, you might need to have other investigations in hospital, such as X-rays or a CT scan. If your tooth is loose, your dentist may suggest a technique called splinting. In this, your dentist will place your tooth back in its right place or as close to that as possible, and help it stay there. They’ll do this by attaching your tooth to the teeth next to it, usually using wires or white filling material called composite. Alternatively, or later on, your dentist may take impressions of your teeth and make a plastic splint. They’ll put the splint on your loose tooth and the healthy teeth either side of it. It may stay in place with suction from your saliva, or your dentist can keep it in place either with cement or wires attached to nearby teeth. You’ll need to wear the splint for a week or two to allow the area to heal. If your tooth has been completely knocked out, your dentist will reimplant it. If you’ve already done that, they’ll check the position for you. They may then fit a splint to keep it in position. If part of your tooth has broken off, your dentist may smooth the edge and place a tooth-coloured filling over it. The filling may be a temporary one until the area settles, so as not to cause any more trauma to your tooth. You may then have a more permanent filling later. Your dentist will examine you and remove any fragments of tooth from your lips or gums and clean the area. You may need dissolvable stitches. If the blood vessels and pulp inside the tooth have been damaged, you may need root canal treatment. It depends on how bad and where the chip is (if your root canal is involved in the damage or is close to it). There’s a chance your tooth could die and need root canal treatment later – this could happen anytime, even years or decades later. So keep an eye on your tooth. 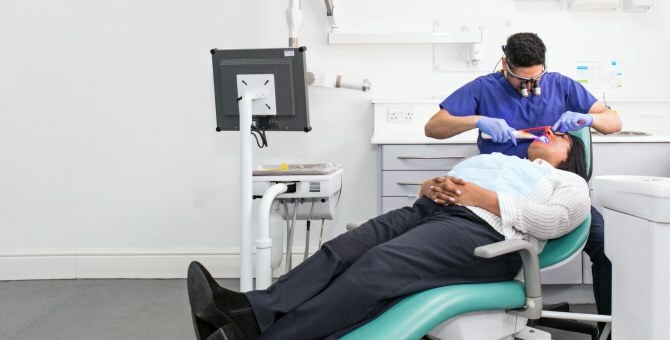 If you get any pain or swelling or discolouration of your tooth, go and see your dentist. If your tooth has fractured below your gum level and there’s damage to the root, it’s unlikely that your dentist will be able to fix it. They may need to remove your tooth and fit a temporary bridge or denture. Eat soft foods and be careful when eating. If your mouth is swollen from the injury, be careful you don’t bite the swollen areas. Keep your mouth and teeth clean. You could use a mouthwash or put a teaspoon of salt into a cup of warm water to gargle. Be gentle but thorough when you clean your teeth. Don’t play any contact sports or do any activity that could harm your healing mouth, until your dentist says it’s okay to do so. Take over-the-counter painkillers, such as paracetamol, during the first few days if your mouth is sore. If your dentist has prescribed antibiotics, make sure you take the full course. Contact your dentist if the pain gets worse and you have a bad taste in your mouth, because these could be signs of an infection. If you have missing teeth, you may be thinking about replacing them to improve the way you look. But replacing missing teeth may also let you eat more comfortably, speak more clearly and help to keep your mouth healthy. Straightening your teeth can make them both look and work better. Treatment involves wearing a fixed or removable brace to help correct problems such as crooked or crowded teeth.